Binara Full Moon Poya Program will be held on Saturday, September 17, 2016 from 7:30 am to 6:00 pm at the Georgia Buddhist Vihara. We invite you all to join the program. The most historical event that happened on Binara Pura full moon Poya day was the establishment of Bhikkuni Order. On the initiative of the Maha Prajapati Gotami the Buddha allowed the (Upasika) woman to enter the order. Maha Prajapati Gotami was the sister of Queen Mahamaya, mother of Prince Siddharta Gautama. She is the aunt of the Prince. Following Mahamaya’s passing away, seven days after the birth of Prince Siddhartha, it was Maha Prajapati Gotami who brought up Prince Siddhatta. According to the history of Buddhism, Maha Prajapati Gotami was the first Bhikkuni in Buddha Sasana. 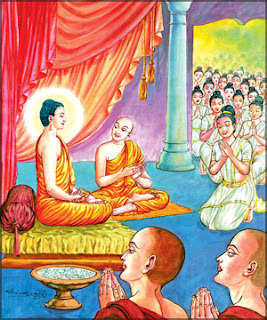 She entered the Order with five hundred princesses on a Binara Pura Pasalosvaka Poya Day and thus began the Bhikkuni Order. 5:00 pm: Atavisi Pujava and end of the program.